The ancient Egyptians and Romans discovered methods of producing coloured glass and the Venetians in the late 13th century acquired the skills from Constantinople. 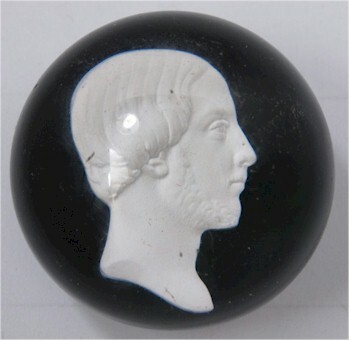 However, with the exception of French portrait or sulphide paperweights, it was probably the Bohemians who made the first paperweights as we recognise them today, at some point during the 1830s or early 1840s – though I suspect the Venetian's would strongly contest that. Certainly, the first paperwieght to bear dated canes were French weights, with St Louis starting this practise in 1845 and Baccarat a year later. It was this period that heralded the golden years of paperweight production, which lasted from 1845 until around the 1870s, with Baccarat, St Louis and Clichy being the primary producers in France; George Bacchus in England and Gillander and the New England Glass Company in America. An English overlay basket weight. 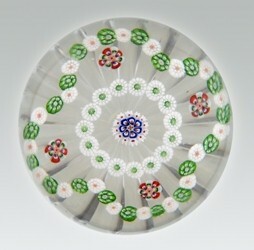 The majority of paperweights are of the millefiori or 'thousand flowers' type, being made up of multiple coloured canes, sometimes on a coloured ground. The canes, though often of flower shape, can take any form, including the so called pastry canes (that look like small pies), the cabbage canes that are synonymous with Clichy or the silhouette canes of animals and figures from Baccarat. These canes can either be randomly spaced, in concentric rings or scrambled with or without the addition of gauze that can be used to create compartments within the body. There are the sulphide portrait paperweights made in France and England that contain a silvered cameo within them and, finally, those containing exquisitely modelled flowers, fruit or butterflies or very rarely a salamander, most of these being of French origin. Finally, further enhancements can come in the form of being overlaid with coloured glass, which can be cut to form decorative patterns, windows or even to simulate baskets. Another group of 19th century paperweights are the English dumps - large, rather clumsy-looking pale green ovoid weights - sometimes used as doorstops that are often enhanced with decorative air bubbles or simple sulphide flowers. 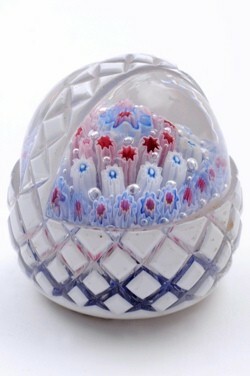 The fussy and busy design of paperweights, despite the skill and complexity of their construction, saw them fall from grace in the later 19th century before a revival in the 20th century from the usual French suspects and new arrivals from England in the form of Arculus and Walsh Walsh and latterly Whitefriar's and, of course, the Scottish makers Caithness, Perthshire and Strathearn as well as the cheap Chinese imports.